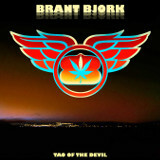 Former Kyuss drummer Brant Bjork's last album, Black Flower Power, had a dirty flair to it that was slightly more hard-edged than Tao of the Devil turns out to be. This one's a slightly mellower version of Bjork's desert stoner sound. Still firmly wedded to a doomy, overdriven tube sound and bluesy rock, Tao of the Devil proves to be more accessible to a hard rock audience, though slightly less appealing to metal fans. The Gree Heen, a timeless jam that could have fit in anywhere from the early 70s till the present day, starts the record off. Bjork, despite being most famous for his 90s-era drumming, is a guitarist of no mean ability, and though there is a certain aimlessness to the songs on occasion, they always come back together by the chorus. A hypnotic, heavily-overdriven lead adorns Stackt, and Luvin' has the snappiness of Keenan-era Corrosion of Conformity song, even to the singing style Bjork uses for this one. However, the mean edge of Black Flower Power, which I enjoyed so much, is gone, and what is left inherits a lot more from psychedelic rock of the late 60s and early 70s than the Black Sabbath influence that stoner rock took equally on as part of its pedigree. Nobody can say rock instrumentals of the sort found on Dave's War aren't nice to listen to; the ethereal jam vibe of Dave's War has enough early stoner authenticity in it to convince the listener that Brant Bjork could have been born a generation too late. But even the creeping riffs of the title track is a lot more blues than metal, with none of the aggressive dreaminess of, for example, Where You From, Man? on the last album. Bjork's accomplished musicianship delivers results on Tao of the Devil, and having seen his live performance in the past, I can guarantee it would be top-notch with this batch of songs to work with or any other. It's a little too soft for many metal listeners, with this one falling firmly on the "rock" side of the divide, but it sounds quite good.